An hour south of Los Angeles is the city of Long Beach, It was here that a significant film factory, the Balboa Amusement Producing Company got its start in early 1913. After receiving a $7,000 inheritance from his father, Herbert M. Horkheimer came to the small town to engage in the production of motion pictures. He took over one small building and a 25 by 75 foot platform stage which had recently been abandoned by an Edison Company production unit under the direction of J. Searle Dawley. Located on the southeast corner of Sixth and Alamitos Streets, the studio contained dressing rooms, offices, carpenter shops, laboratory, property departments and a half dozen other necessary adjuncts all under one roof. He gathered together half a dozen actors, some carpenters, stage hands, a cameraman and a few laboratory assistants and began to shoot his first picture. All told, the first week’s payroll numbered twelve people and the operating expense totaled about $500. Not long after he got started, Horkheimer found that he needed assistance. So he invited his brother, Elwood D. Horkheimer, to come west and join him. E.D. accepted and became the company’s secretary and treasurer. 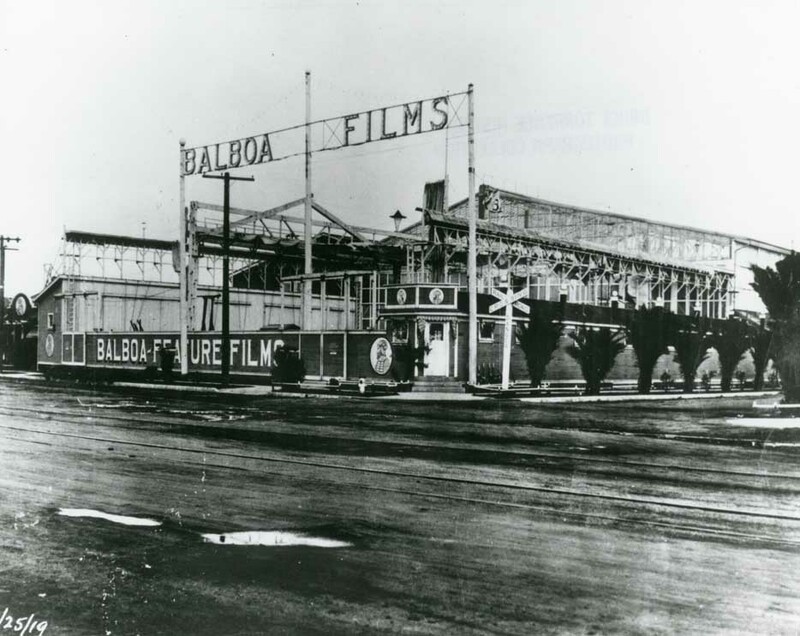 All the films made at the Balboa plant were produced by small independent production companies who simply leased space at the studio. Originally, most of the pictures filmed at Balboa were marketed under the names of other companie s. It wasn’t long, however, before this practice was discounted and all films were marketed under the Balboa banner. In 1914 , the company jumped into the limelight when it produced three films, “The Sea Wolf”, “A Piece of Steak”, and “To Kill a Man” based on stories written by Jack London. Visit hollywoodphotos.com to view many Balboa Studio photographs. Balboa’s production was quickly flourishing with such actors as Neva Gerber, Jackie Saunders, Henry King, Dorothy Davenport and Henry Stanley. Most of the early films were one reel dramas or comedies with such titles as “Thou Shall Not Steal”, “The Counterfeit”, “The Path of Sorrow” and “St. Elmo”. By the end of the first year, the company had scores of employees on its payroll and had produced over a hundred pictures. With production rapidly increasing, the original building was outgrown by the end of 1913. So a piece of property was acquired across the street and on it a modern outdoor stage was erected and supplemented with carpenter shops, scene docks, property rooms and the like. The general offices and scenario department were housed in an adjoining bungalow. The first building was then remodeled and served to accommodate the laboratory and wardrobe departments. Subsequently, even these quarters proved too small. They embarked on an aggressive expansion program and when finished the Balboa Studios was spread over eight acres on all four corners of the intersection. In addition to the typical studio buildings, a wild animal farm was constructed in 1914 for the filming of adventure dramas. The second year of the company’s production was its most expansive. In February, 1914, Horkheimer struck a deal with William Fox’s Box Office Attraction Company to have them distribute Balboa’s films.. This was a major commitment for Horkheimer’s burgeoning company. In order to insure prompt delivery of films, he doubled the working staff and laboratory departments. Within a few months, there were several production units grinding out thousands of feet of film each week. The quality of films made at the Long Beach studio attracted a host of additional actors, including such notables as Anita King, William Desmond Taylor, Theda Bara, Baby Marie Osborne, Lewis Cody, Ruth Roland and Gloria Jay. Two of Balboa’s most popular comedians were Roscoe “Fatty” Arbuckle and Buster Keaton. 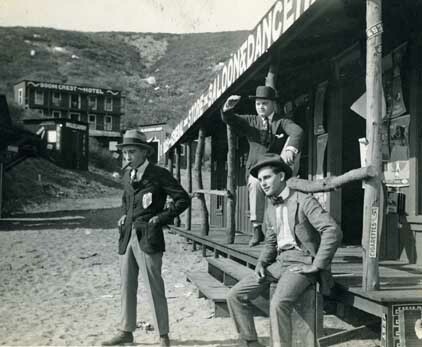 In December, 1917, Arbuckle, and Keaton left Sennett’s Keystone and arrived at the Balboa Studios with Fatty’s production company, the Comique Film Company. During their brief stay, the two of them made several two-reel comedies. 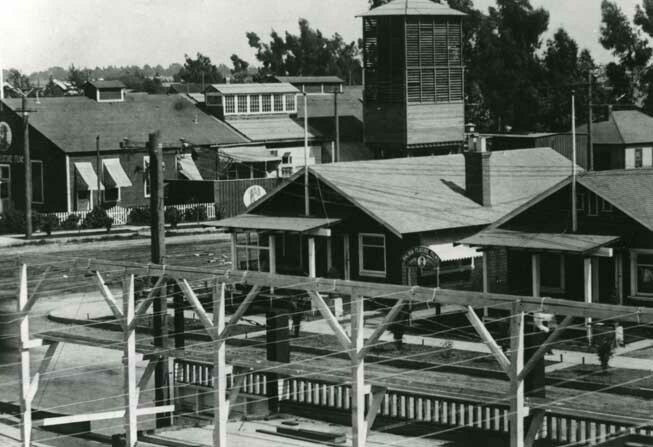 The studio became Long Beach’s largest employer. As many as ten production companies, including the Kathleen Clifford Company, the Anita King Company, the Mona Lisa Company and the Comique Film Company were shooting simultaneously at the plant. When at its peak, the Balboa film factory was cranking out three hundred pictures a year and releasing them through such large distribution companies as Paramount, Fox and Pathe Freres. But the fall of Balboa was as meteoric as its rise. Several factors contributed to the company’s eventual downfall. Competition from other studios was simply carving up the pie into smaller pieces. At the same time, the Great War not only made film stock rare and expensive, it also drastically reduced the foreign distribution of films. To make things worse, the American public was cutting back on the amount of time it spent at the movies. As early as 1916, Pathe Freres, one of Balboa’s releasing outlets, issued a warning to the Horkheimers to slow down production. Unfortunately, their warnings were not heeded. By 1917, the entire movie industry had entered a slump with many prestigious companies going out of business. Those who continued to operate saw their production cut and many of the distributors were unable to sell their films. By late 1917, Balboa had reduced its film production, but it was too late -- the Horkheimers were broke! Shortly after the brothers filed voluntary bankruptcy on March 25, 1918, Balboa was assigned to the Los Angeles Wholesalers Board of Trade to act as trustee for the creditors, which included three Long Beach banks. It was agreed that the trustee would take possession of the plant and continue the studio’s operation for the benefit of the creditors. In July, 1918, Buster Keaton left Balboa to serve as an American soldier in Europe. To disassociate himself from Balboa’s financial woes, Fatty Arbuckle took his Comique Film Company to make films elsewhere. During the next seven years the studio was leased to several film companies, including the New Art Film Company, Mercury Comedy Company, Holly Comedy Company, Columbia Film Company,Atlas Film Company and Morante Motion Picture Company. At the same time, portions of the studio property were sold and their buildings demolished. In March, 1923, the remaining two and one half acres were sold to Charles W. Harlow, a local oilman and financier, for $260,000. By March of 1925, the last vestige of the studio fell to the wrecker’s ball and the property subdivided into individual business and residential lots.